Come on in! I'm glad you're here. 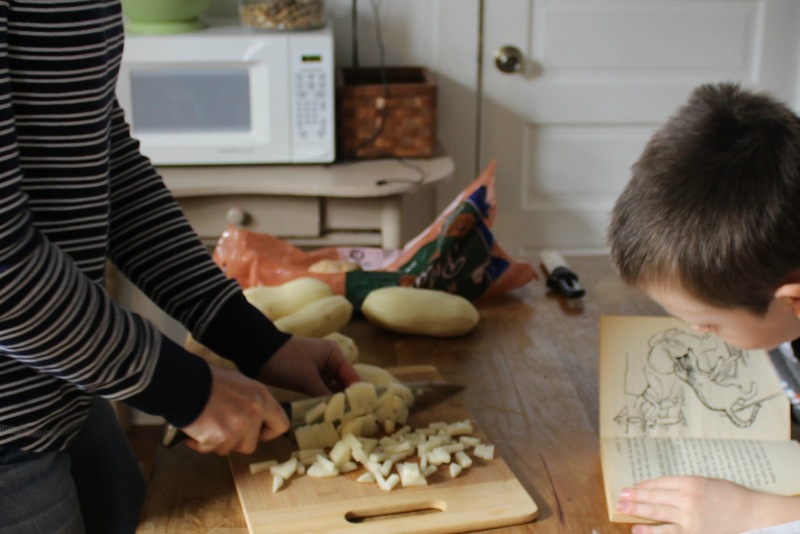 Pull up a chair and join us for a look at one random day in our homeschool. Before you hunker down and get too comfy, let me just fill you in on a couple of details which might make the controlled chaos of this particular day make a little more sense. This was a Monday. And to be quite honest, on Mondays, even my coffee needs coffee. You'll notice several interruptions to the day due to the heating issue. But, that's the nature of combining home and school. A "typical" day is only typical if it is imperfect. In general, I prefer to plan a rhythm to the day not a time-ordered schedule. I took note of specific times for the sake of this little show-n-tell. Remember, there is no ONE WAY to homeschool. Some of you might see our day and say, "not enough" while others might think, "way too much!" For us, it is just right. But, that's the beauty of homeschooling, it's always tailor-made. As you know, I'm all about efficiency. So, let's streamline this little daybook to make it more readable, shall we? 9:08- Morning time begins with our hymn of the month. 9:19- Begins to wrestle with the dog and to look through the library basket. I tell him to leave the dog alone. 9:21- We finish morning time. I push the "start" button on the coffee pot and announce silent reading time. (This is when we all read a book silently to ourselves...even me.) Looks at picture books. 9:22- The power goes off due to all the space heaters we have plugged in around the house. Runs to the basement to reset the breaker. I restart the coffee pot and we continue reading. 9:29- Starts to wrestle with the dog again. I encourage him to find a new book and to come sit by me. 9:33- Tells #5 to leave the dog alone. They begin to argue. 9:37- After reading for 15 minutes, we put our books away and head off to start the first trio of the day. 9:38- I go to pour myself coffee and notice that the pot has overflowed all over the counter and the floor. (I'm a notoriously BAD coffee maker. I somehow mess it up nearly every day. My coffee pot and I have bad blood. If you ever come over for a coffee date, bring your own. Most of my other friends do. Trust me.) I clean up the mess and try again. 9:40- I send #2 down to the basement to grab a bin of toys for #5 to play with in the living room during our first trio. 9:43- I give the first assignments of the day. Starts his math on the computer. 9:45- Starts playing G.I. Joes in the living room. Starts copywork at the dining room table. Reviews last week's writing and language assignments. 9:50- I tell him to stop reading for a second so that I can take a bathroom break and re-pour my coffee. 9:52- Reading out loud, take 2. 9:54- Finishes his copywork and comes into my room to ask me some questions. Has to stop his reading again. I remind #4 not to interrupt someone else's reading time and send him off to have a break. Goes and plays with #5 in the living room. Reading out loud, take 3. 9:57- I hear #4 and #5 arguing in the living room. I ignore it and they quickly resolve the problem themselves. 10:01- The arguing resumes and I eventually have to call to them to be quiet for the sake of others who are working. The argument ends and they continue playing. #1 reading her world view book, #3 doing his math, #4 & #5 playing G.I. Joes. 10:06- Continues to read. I finally get to do my hair and make-up. 10:09- Sits on the floor to read so that I can make my bed. 10:12- I begin to fold clothes on my bed while #2 continues to read out loud to me. I hear #4 and #5 playing G.I. Joe "wars" really loudly. 10:15- I ask #4 and #5 to play "war" more quietly or go downstairs and play. 10:18- Begins to cry in frustration because he can't fit his G.I. Joe into one of his army cars. 10:29- I pause laundry folding to check over #3s completed math assignment. 10:37- Starts reviewing for a math test. I resume folding. The laundry pile on my bed. 10:49- A couple of the boys begin to sing a song in the living room, but end up singing the wrong lyrics. Stops her test to sing the right ones to them. Then gets back to her test. 10:51- Finds a nickel under a chair and brings it to me so that I can put it in his piggy bank for him. Asks me to define an unfamiliar word to her. 10:54- I check #4s copywork. I notice uncharacteristically sloppy work and have him do the entire portion again. 10:56- The furnace company calls. 10: 57- I begin to pop the popcorn and put a few clean dishes away that had been drying on the counter. Finishes his copywork do-over and goes to play again. Asks me to spell a word for her. 11:02- The boys help me clear the table off for snack time. Finishes her math test and sets it in my "needs to be graded/checked over" spot. 11:05- Everyone sits down for a snack while I read out loud from our current medieval (living) history book. History read aloud during snack time. 11:12- The history reading gets interrupted by a call from the furnace repairman. 11:15- Is done with his snack. Puts his plate away, washes his hands, and goes off to play. 11:30- I brainstorm some history notebooking ideas with the oldest three and write some key terms down for them to help them with spelling as they complete a page in their notebook. #4 and #5 play in the living room. 11:33- The oldest three begin notebooking about a medieval siege. Comes to the table for phonics. The three oldest working on a history notebook while #4 plays a review game for phonics. 11:37- Just stares at his notebook and can't seem to figure out how to start. I give him a suggestion for a starter sentence. Asks me to spell a word for her. 11:42- Gets done with her notebook page, takes the computer into my bedroom and begins her typing lesson. (My kids use this program.) Follows her to watch her type. 11:49- Begins to get too silly and distracted during phonics and I remind him to focus and stay on task. 11:53- I finish teaching the phonics lesson and explain #4s phonics worksheet directions to him. 11:55- Begins his phonics worksheet. I put the phonics review game and other materials away and look over #2s completed notebooking page. 11:56- Finishes his notebooking page and I look over it. 11:58- Heads downstairs to the boys' room to play. I continue to put the phonics materials away. Makes a few spelling corrections on his notebooking page. 12:00- Since he is the last one done with his notebooking page, he begins putting all the supplies away (colored pencils, erasers, history read aloud, etc.) I start to make lunch. 12:03- I look over to find that #3 did not put the notebooking things back the way he was suppose to and have to remind him that since he was the last one finished, he has to clean up the remaining supplies. 12:04- The power goes off AGAIN! (This is getting really old!) Heads to the basement to reset the breaker. I call #3 into the kitchen so that he can read out loud to me while I make lunch. Making lunch while #3 reads out loud to me. 12:08- Begins to get distracted and I remind him to finish up his work before lunch. Finishes up her typing exercise. Goes to the living room to play. 12:12- Goes to her room to read a book in bed. Follows her upstairs to her room to show her a toy he built. 12:17- Finishes his phonics pages and goes to play in the living room. 12:19- I ask #2, #4, and #5 to start picking up the toys in the living room before lunch. 12:20- Finishes his reading and goes to help the other boys clean up the living room. 12:25- The boys finish cleaning and go downstairs to play. 12:26- The dog knocks over two of my folded laundry piles on my bed and I have to go in and refold/stack them. I, then, go back to cooking lunch. 12:34- With lunch simmering, she goes off to do her vocab lesson. #5 and I sit down to glue a few pictures into his alphabet picture book. 12:36- Finishes vocab and takes a break to play with the dog and help the younger boys set up an army camp in the living room. 12:43- Finishes his alphabet book and helps to clean up the supplies and mess. 12:45- Goes back to her room to read. 12:46- Reads to me while I put last night's dishes away that were sitting on the counter in a drying wrack. 12:50- I take another momma bathroom break. Knocks on the bathroom door and asks me to help him carry up a bucket of blocks from the basement. I tell him that he'll have to ask his older brother to help him. Continues to read out loud through it all. 12:54- I begin to dish up lunch onto plates and call #5 to set the table with forks and napkins. 12:56- The Hubs comes home for lunch. Finishes his reading. 1:00- We all sit down for lunch. 1:14- I finish eating and start cleaning up the kitchen. Takes the dirty laundry basket downstairs to the laundry room for the younger boys to sort later. He starts a load of laundry in the washing machine. Practices piano. #3 and #5 continue to slowly eat their second lunch. 1:15- The Hubs hauls a few items down to the basement for me and puts them away. 1:20- Starts wiping down the bathroom for a daily cleaning. Finishes lunch and begins to sweep the kitchen and dining room floors. The Hubs and I look at our online bank account. 1:28- I start the dishwasher. Finishes cleaning the bathroom. Finishes piano practice and begins bouncing a basketball in the entryway again. Plays in the living room. 1:31- Finally finishes his lunch and cleans up his spot at the table. Finishes sweeping. 1:33- Begins dumping the trash from all the small trash cans into the larger kitchen trash can for #2 to take outside later. Goes to read on my bed. #5 emptying all the small trash cans into the larger kitchen can. 1:35- I call #3 back into the dining room to re-sweep a spot he missed. #3 and #4, then, go down to the basement to sort dirty laundry into color piles. 1:36- Decides to go to the basement to help his older brothers sort laundry. 1:42- #3 and #4 bring up the empty laundry basket but forget to put it away. For the sake of time, I do it for them. 1:43- I call everyone into the living room for story time and notice that the boys did not put the books back into the library bucket correctly when they were cleaning the living room before lunch. I ask them to fix the books. 1:45- The power goes off again. Resets the breaker. 1:51- I go to put #5 in my bed for a nap and notice the forgotten laundry piles. I move a few piles to make room for him, sing him two songs (as is our routine), and kiss him goodnight. The older children play G.I. Joes in the living room. 1:54- I read one chapter to the oldest four kids from our current read aloud while they play quietly on the floor. Reading a chapter from our current read aloud while the older kids play on the floor. 2:12- #3 was assigned to gather paper towels for the project but gets distracted and doesn't obey. I remind him again. 2:15- We all sit down to paint a winter scene that we had sketched the previously Thursday. 2:30- I finish my painting and begin cleaning up the art supplies that are not currently being used. 2:34- Finishes his painting and goes to sit at the kitchen table to write the final draft of a story he has been writing. 2:35- Finishes his painting and goes to play. Finishes her painting and goes to read in the living room. 2:38 - I gather up the supplies I need to teach math to #4. 2:41- #4 and I sit down to do math at one end of the dining room table while #2 sits at the other end and continues painting. 2:43- Finishes up his painting and goes to the living room to do his math on the computer. 2:44- Takes the dog outside. 2:45- Asks me to type-in the computer password so that he can start his math. 2:46- I explain a grammar assignment to #1. 2:47- Does her grammar assignment in the dining room. 2:48- I continue the math lesson with #4. 2:56- I finish the lesson and give the directions for the first section of his math worksheet. Works on the first section while I put the math supplies away. 3:02- Has a grammar question and I help her. 3:06- Gets distracted while doing her grammar assignment because #4 begins chanting while working on his math page. She asks him to stop. 3:07- Finishes her grammar. I take another bathroom break. (Are this many bathroom breaks normal? Maybe I should get that checked out?!) Begins taking out all the materials for spelling. 3:10- I notice that #3 is just daydreaming when he's suppose to be working on his final draft and I remind him to get busy. Finishes math and starts a drawing project by the dining room window. 3:11- I do spelling with #1. Working on spelling with #1. 3:12- #4's drawing project somehow gets really loud and I ask him to be quiet while #1 does her spelling. 3:16- Has a grammar question about his writing project. 3:21- Finishes spelling with me and is assigned to copy two words that she misspelled a few times during spelling practice. She copies them each ten times onto a sheet of paper. 3:22- Begins spelling with me. 3:24- Is finished with her school day and goes off to read a book. The Hubs comes home from work. 3:26- The Hubs wakes #5 up from his nap. 3:29- Takes a break from his writing to eat some peanuts with the Hubs. 3:30- Finishes spelling and has to copy his two misspelled words ten times. I begin to look over the day's completed assignments. Finishes math and reports his score to me and we discuss it. 3:33- I do spelling with #2 and look over completed assignments at the same time. The Hubs, #4 and #5 eat peanuts in the kitchen. 3:41- Finishes spelling and goes to eat a snack but NOT peanuts. I finish looking over the day's finished assignments. #2, #4, and #5 go play together. 3:48- I call #4 to the dining room table so that he can make corrections to some of his work from earlier in the day. 3:52- I finish looking over the day's work and open the mail. 3:53- The Hubs calls #2 and #5 to put away the toys that are scattered all over the living room. 3:54- Finishes his corrections and goes to help the other boys pick up toys. 3:58- The boys finish cleaning the living room. #2 draws some sketches during passion hour. 4:19- Finishes his piano practice and goes to the basement to build with Legos. Reads a book with The Hubs. 4:30- Passion hour is done! #3 plays piano and #5 looks at books during passion hour. Pheww...that was a long day! I'm kind of tired just re-hashing it. In the end I forgot to read a simple chapter book to #4 and #5, I didn't have time to read any nursery rhymes to #5 (as is our Monday habit), #3 never got to spelling or handwriting, and #2 never did his grammar assignment. I'll not grow anxious in well-doing. I'll let tomorrow take care of itself. I'll never allow us to get behind because there's no such thing as "behind" in a life-long education. Please remember that at the end of the journey, homeschooling is about producing PEOPLE, not a PRODUCT. The lesson plans that come with the pretty boxed set of books should be used as a guide, not a dogma. Homeschooling should focus on relationships and the best plan for your particular child at this particular moment. Don't allow my finish line or anyone else's finish line to determine YOUR race. Every family culture and rhythm is different. This was just one Monday. A Monday among many. Sure it had its ups and downs. Don't all days? But, we laughed, we learned, we loved. And that's the point! So thankful you shared so honestly!! Some days I feel like we got nothing done and I'm the only one. This was really nice to see that you and others have crazy days/moments too. Thank you for the encouragement. I love reading your blog!! There are no such things as "normal" days. They only exist in fiction. 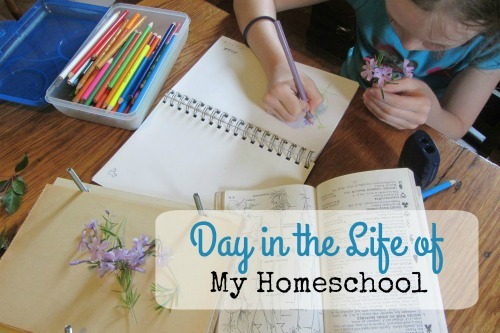 Thankyou so much for sharing your "a day in the life of a busy homeschool family!" It was great to read all about your typical day! If I was to write down one of our days, it would sound so much like yours! I would love to come for coffee someday and share homeschooling stories:) If I could afford it, would also buy you a Keurig or Tassimo! I have a Tassimo, and it's a lifesaver:) I enjoy all your posts, and have learned a lot from you! Thankyou so much. Oooo...A Keurig. Maybe I'd actually be able to make coffee like a grown-up! Tee-hee! Thanks for your encouraging words. Reading this made me feel so "normal" as a homeschool mom. Thanks for the encouragement! I loved this post! I was laughing through some of it, silly power outages. I'm learning as a momma and a homeschooler we that humor in so important. Like David Burke said, "The anarchy of parenthood is inevitable, and trying to resist it will probably only net you a slow descent into madness." I loved seeing a glimpse into "real" life at your house. Thank you! I love that quote. So very true. We have a dog too and I ask myself everyday how this one creature causes so many distractions! Even when she is causing no trouble I have to itch her or she digs my arm to keep itching! Good thing they have their cute moments too! I loved that your boys eat "second lunch"! I have 3 boys of my own and I tell ya eating is a hobby to them!! :) I loved seeing what your day looks like, I too sometimes feel exhausted at the end of the day but feel like we got nothing accomplished! I have to keep reminding myself that its the heart that matters and the curriculum is just a guide! Yes. So true. Honestly, I don't even sweat it. My kids are right where they are suppose to be in their learning journey because it is THEIR learning journey. This is just great. I so appreciated smiling and giggling as your day felt all-too-familiar! It is so nice to see the good, the not-so-good and the "real" ins and outs of a homeschool day--it makes me feel sooo normal! The good..the not-so-good...that's all part of REAL life. Thanks for reading! Loved your Day in the Life! Yes, peeing that much is normal! I drink lots of water and 3 cups of coffee a day, so I take many potty breaks! Also glad we are not the only ones with a distracting dog. You walk through your day, interruptions and all, with such grace! I think when we go into our day expecting that some of those things will happen, we can flow with it more rather than fight against it in frustration. And, at the end of the day, look at the progress that was made and the fruit that is growing from your training!! i sooooooo agree, Michelle. Interruptions ARE going to happen. The day will never go as planned. So, if we plan for that, our day will feel much more successful. 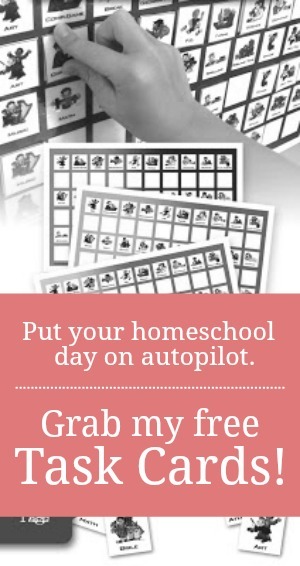 Your blog is my absolute favorite for homeschool mom encouragement. Thank you. Thanks for sharing! I am curious about your the routine and rhythm for your day - even though you don't have things scheduled minute by minute, do you still have set times for any of the events of your day (other than your 8:30 start time), such as lunch at a specific time? Do you have goals for certain subjects to be completed before snack time or lunchtime, etc? Good question! I kind of know which subjects I'd like to get to before lunch in order to have time to fit it all in the day. I also know roughly when my husband will come home for lunch. Mostly what I do is continue the same pattern of activity from day to day. Most subjects generally take about the same amount of time each lesson. And so as long as I can start on time and keep moving forward, we almost always get to everything by quittin' time. As a mom just starting to think about homeschooling, your family looks like a well-oiled machine! I'm impressed by your multi-tasking and your kids doing what they're supposed to. Also good to see that there's lots of play and interaction between siblings - definitely a benefit from homeschooling in my opinion. Fun read! Thanks for giving us a glimpse into your day, Jamie! Tiffany, the baby stage is so very short. Give yourself grace and let them play. There have a whole lifetime of learning ahead of them. Believe me. I have two boys (5 and 8)and almost all of our days look something like this. I've been so worried that I wasn't doing this homeschooling mommy thing the right way. Thank you so much for sharing this realistic look at what it's like to educate our little darlings at home.